The slope side Private Residences at One Steamboat Place are located in the Gondola Square in Steamboat's Mountain Village. With two bedrooms and a den, Three Forks Mountain Residence is a remarkably private residence offering premier lodging within a world-class resort and spa. 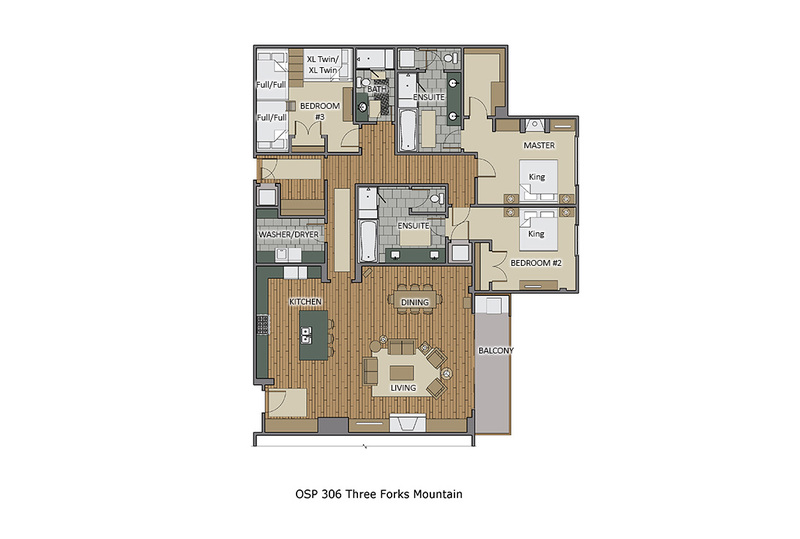 As a three bedroom residence, the Three Forks Mountain Residence is unique among other residences at One Steamboat Place and ideal for two couples or small family. Three Forks Mountain Residence offers a Master Bedroom with in-floor heating, fireplace and an oversized en suite bathroom with steam shower, double sink vanity, rain showerhead, and Jacuzzi tub. There is also a Junior Master Bedroom with a private bathroom. The den offers two sets of twin bunk beds and a large closet.